Walking with my family and Bellingham First Congregational in the Pride Parade this afternoon. When our pastors walked in front with their robes and stoles on, I cried. Indeed, God loves everyone. And a little meandering at the Bellingham Farmers Market where I bought a couple pounds of the World's Most Beautiful Summer Squash. Smooth, bright yellow, thin-skinned, firm, small. Just completely perfect. We slathered grilled bread with pesto, laid some thick slices of French feta, then piled this salad on top of that. That was dinner, and there were groans of delight all around the table. To make: Cut several small summer squash lengthwise into 1/4" thick strips. Grill with olive oil and a bit of salt. 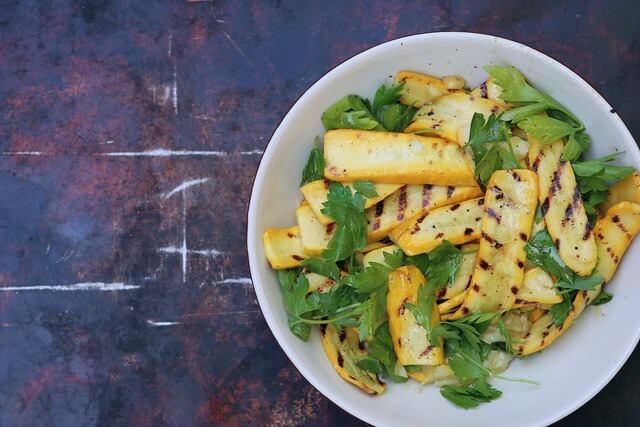 Toss the grilled squash with a few tablespoons of smashed preserved lemon (pulp, peel, and juices), olive oil, pepper, and lots of parsley leaves.